Lot 380. 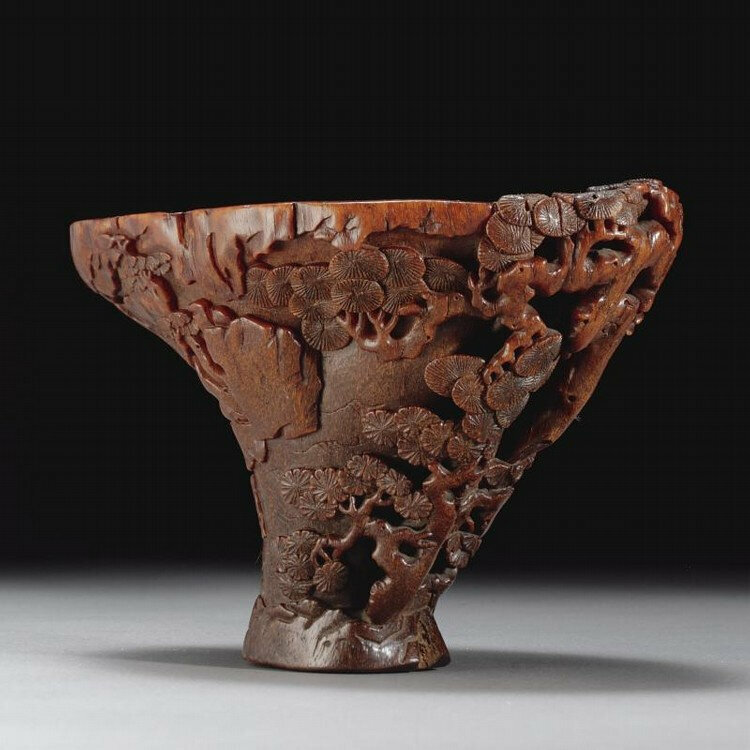 A large 'pine forest' rhinoceros horn libation cup, late Ming-early Qing dynasty, 17th Century; 6 5/8 in., 16.8 cm. Estimate 30,000 - 40,000 USD. Lot sold 72,000 USD. 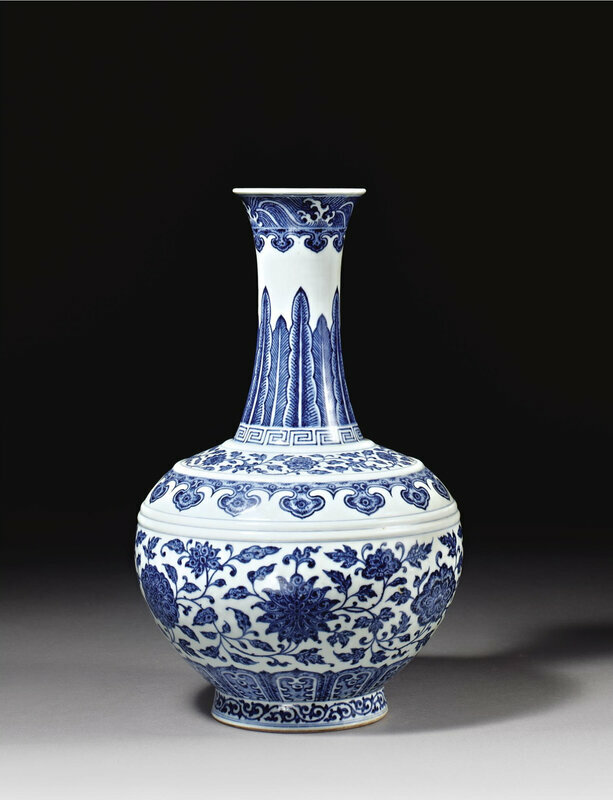 Photo: Sotheby's. the heavy and large truncated tapering horn carved with pines, paulownia and flowering trees scattered across mountain cliffs and high rocks, unusually empty of people and pavilions recalling a desolate mountain retreat, with a flowing stream depicted by unusual shallow-incised detached wavelets, the interior also unusually carved with deep fractured rock formations, with the handle at one end formed by a tall pine rising up and flowing over the rim, wood stand. Provenance: Collection of Kenyon V. Painter, Cleveland, Ohio & Arusha, Tanzania, circa 1910s-40s. 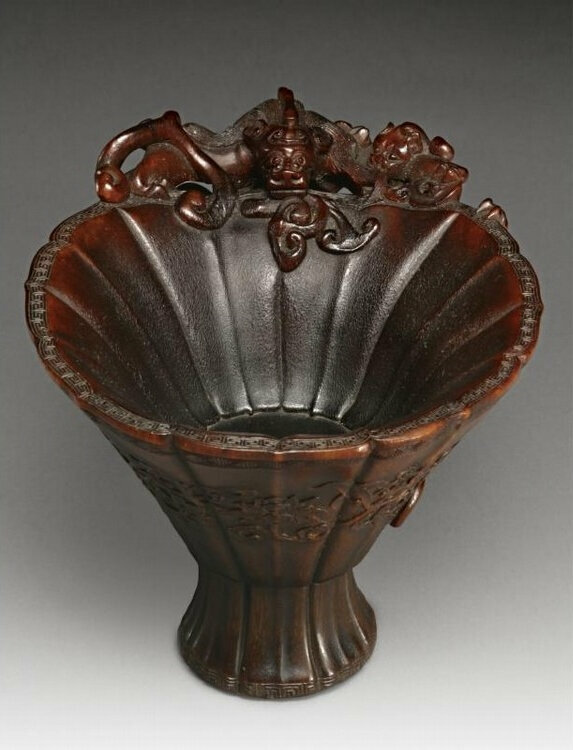 Note: Compare a cup with hunting riders, the rivers incised with similar wavelets and the foliage similarly carved, in The Complete Collection of Treasures of the Palace Museum, Vol. 44, Hong Kong, 2002, no. 146, pp. 168-169.